I have to admit. I think I’ve lost some of my crafty “mojo” the last couple of weeks. There has been SO much going on in my life lately, along with some physical things as well, it truly has been hard to find my creative spirit. I thought after the wedding I would get a nice little “break” and slowly get back to reality. Unfortunately, that was a dream. Life had different plans! 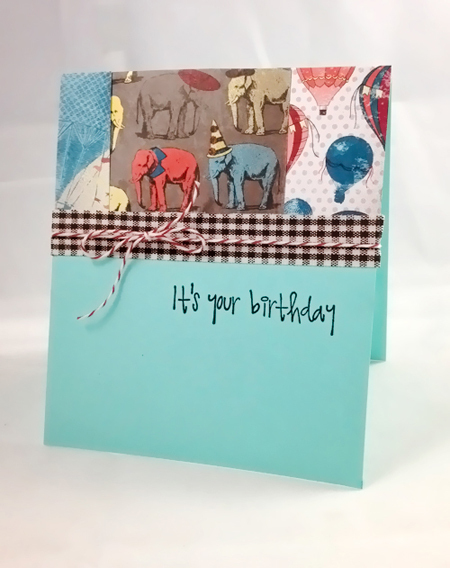 I thought I had lost all hope till I came across these fun patterned papers from my stash (Stampin’ Up!). It’s amazing how products can be so inspiring. I think that’s going to be my resolution for 2013 in my card making world. Work with products that don’t make it work! If I had all the time in the world I would love to create my own details, but unfortunately I don’t right now (and probably won’t ever!). I hope to find many more products to “inspire” me and keep me going on this crazy road ahead! I knew I wanted to play along with Retro Sketches Challenge #46 . The sketch is just so fun! What are your “go-to” products when you are having a creative rut? Hope you are having a great week! It will come back soon, I promise. 😉 Just wait a couple more weeks. But it doesn’t look like it’s gone anywhere to me!